Dr. Tom Levy, noted author and authority on the healthy properties of vitamin C, says this is a revolutionary discovery, possibly the greatest advancement in human health in the history of modern medicine. Many generations ago humans synthesized vitamin C internally – via the enzymatic (gulonolactone oxidase) conversion of sugars (glucose from the liver, sucrose and fructose from the diet) to ascorbate (vitamin C) as they pass through the liver. A universal gene mutation (GULO gene) halted that defensive mechanism. Most other mammals, with the exception of fruit bats, guinea pigs and primate monkeys, internally produce vitamin C.
Stress releases sugar stores to provide extra energy to address biological or mental threats. Humans lost their ability to internally produce vitamin C on an as-needed 24/7 basis and their ability to deal with biological (mental and physical) stress. Due to inflammation, infection, malignancy or aging, the demand for vitamin C often increases beyond what the diet provides (110 mg/day for typical Americans) or what dietary supplements augment (500-1000 mg per pill). For example, a goat that weighs about the same as a human internally produces ~13,000 milligrams of vitamin C per day and more when under stress. 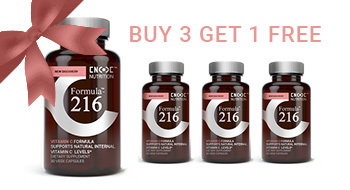 Therefore, Formula-216Ô is the first stress-responsive vitamin C dietary supplement. Vitamin C works to maintain health by pouring electrons to rebalance atoms. The atoms in about 5% of the air humans breathe – oxygen and nitrogen – lose an electron or two, become unbalanced and seek out a donor electron and in so doing damage surrounding cells and tissues. All inflammatory, infectious, malignant and aging processes in the human body emanate from unbalanced electrons (called radicals), instructs Dr. Levy. As a water-soluble nutrient most vitamin C is rapidly excreted in urine flow within 30 minutes. Fortunately, the kidneys recycle some vitamin C as it is excreted to maintain minimal blood levels. Time release vitamin C pills have been designed to help overcome the rapid depletion problem, prolonging vitamin C levels for up to two hours, but still the total number of re-balancing electrons provided by dietary and even time-release vitamin C is not even close to internal synthesis, especially on a 24/7 basis, says Dr. Levy. “Vitamin C pills are akin to using a fire extinguisher over and over to pour electrons on a free radical fire. FORMULA-216TM is like a built-in fire sprinkler system, pouring electrons on unbalanced atoms on an as-needed 24/7 basis,” says Dr. Levy. We’re evolving backwards to what most animals experience — rapid on-demand production of vitamin C.
Animal studies indicate life-long internal 24/7 production of vitamin C prolongs health span — most vitamin C-secreting animals live most of their lives in the wild without exhibiting symptoms of aging, even skin wrinkles, hair loss, or a decline in visual acuity. Vitamin C secreting animals remain free of brain plaque and are resistant over their lifetime to blockages in coronary arteries that produce heart attacks in humans, says Dr. Levy. Whether FORMULA-216TM edits the GULO gene or recycles more vitamin C, or works by some other mechanism, is unknown. Scientists will have to work backwards to determine that. But we do know it is working, notes Dr. Levy. For the first time, humans may be able to stave off the ravages of aging, says Dr. Levy. Instead of waiting for age-related maladies to occur and be treated, maybe humans can prevent or delay them from occurring in the first place, he says. Do as the animals do.